Scientists were amazed after finding that these massive gas giants had a rather unbelievable journey a long, long time ago. The gas giants of Jupiter and Saturn could swallow our planet whole with their incredible size — but at the very beginning, they began as nothing more than a pebble just a centimeter in width. That’s based on a new study published in the journal Nature, which has come to a new theory on how these gas giants came to be the biggest planets — by far — in our Solar System, according to a UPI report. Scientists believe it started way back in the early days of the universe, only millions of years after the Big Bang when the Solar System was just starting to take shape. Clumps of dust and ice started to turn slowly into planets orbiting a very young sun. But how did these gas giants form? The original theory was that ice and dust slowly morphed into large balls, which eventually formed the nuclei of the gas giants Jupiter and Saturn. But the problem with this idea is that the sun’s circumstellar disk would have run out of planet-forming materials by the time they got as big as they are today. So a new theory was proposed by Swedish scientists just three years ago: the pebble accretion theory. It holds that there was a much more sped-up process beginning from nothing more than a tiny pebble that snowballed quickly into these planets. But when this concept was plugged into a computer model, the computer spit out hundreds of Earth-sized planets into the Solar System, which certainly doesn’t quite work with what we know today. So scientists decided to go back to the drawing board, making some modifications to the pebble accretion theory, and they changed the assumptions sot hat pebbles could interact with and influence each other. This would lead to accumulation, and these larger globs of matter would push out smaller protoplanets, allowing them to grow and grow in size. When this was plugged into the computer models, scientists got a very different answer. The computer brought back results of one to four young gas giants, which is exactly where it should have been, and even works well with the Nice model, a model that helps scientists understand how maturing gas giants behaved and interacted with each other as they drifted out farther and farther, deep into the Solar System to the positions where they are today. But now scientists have more questions for the model: specifically, can it make similar correct predictions about the smaller terrestrial planets, like Mars and Earth? Researchers will next use the model to see if it also works in this situation, although this is certainly a good first step that helps explain what had been a big problem for scientists. Jupiter is the largest of all the planets — it’s so large, it’s bigger than all the other planets put together, including Saturn. It is the fifth planet of the sun and has the mass of more than 300 Earths — although, to give you some perspective, it’s just a thousandth of the size of the sun. 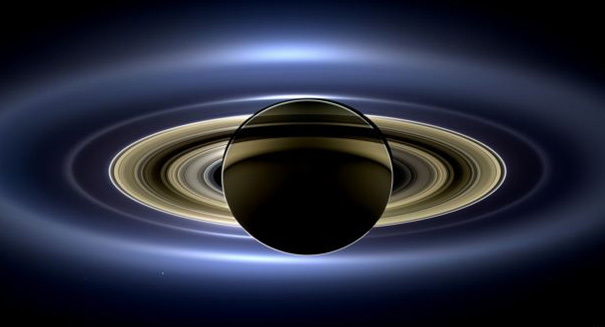 Saturn is the other gas giant. It’s not nearly as big as Jupiter, but it has a mass of nearly 100 times that of Earth’s. The inner four planets are the terrestrial planets of Mercury, Venus, Earth, and Mars, while the last two planets, Uranus and Neptune, are ice giants.